Pedro Julio Serrano was interviewed on CNN en Español immediately following a federal judge’s decision that declared California’s Proposition 8 unconstitutional. His appearance helped frame the issue of gay marriage for millions of Spanish-speaking people around the world. Initial reactions to his appearance were favorable from people all over Latin America. But after gay Latino blogger Andrés Duque subtitled the interview in English and posted it on his blog Blabbeando and on YouTube, praise for Serrano started pouring in from all corners of the globe. Although flattered by the international attention, for Serrano, it was just another moment to stand up for what he believes in. He’s had many such moments in his more than a decade of advocacy. The 36-year-old was the first openly HIV-positive and openly gay person to run for public office in Puerto Rico, where he was born and raised. 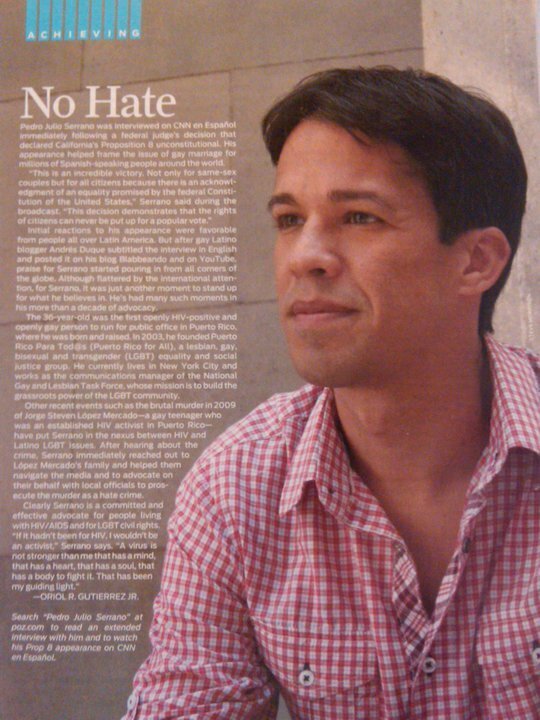 In 2003, he founded Puerto Rico Para Tod@s (Puerto Rico for All), a lesbian, gay, bisexual and transgender (LGBT) equality and social justice group. He currently lives in New York City and works as the communications manager of the National Gay and Lesbian Task Force, whose mission is to build the grassroots power of the LGBT community. Other recent events such as the brutal murder in 2009 of Jorge Steven López Mercado—a gay teenager who was an established HIV activist in Puerto Rico—have put Serrano in the nexus between HIV and Latino LGBT issues. After hearing about the crime, Serrano immediately reached out to López Mercado’s family and helped them navigate the media and to advocate on their behalf with local officials to prosecute the murder as a hate crime. Also, to see The Miami Herald/El Nuevo Herald supplement in English and Spanish about the National Latino AIDS Awareness Day, click here.